Olive oil, our favorite Mediterranean produce since the golden days of ancient Greece. Here's the truth of olive oil, along with some tips on how to buy and store it. Did you know that most generic extra virgin olive oil brands are counterfeit? It's mind blowing how little regulation there is on verified olive oil, and in fact, it's difficult even for professionals to detect the real versus fake stuff. In July 2013 issue of Esquire Singapore, I wrote a bit about the subject matter. Two tablespoons of olive oil a day, they say, keeps the doctor away with its rich antioxidant contents and effectiveness in fighting diabetes, obesity, cancer and heart disease. It’s the health advocate’s savior from the fatty, sweet alternative of butter. It’s food, fuel, skin lotion, pesticide, medicine, and a preservative rolled into one — there’s nothing olive oil can’t do! But what if I told you that the olive oil you’ve been consuming is counterfeit? Even the fancy boutique extra virgin stuff. People have been duped since the sixteenth century, when olive oil was imported to northern Europe and frequently mixed with cheaper cottonseed or rapeseed oil. In modern times, fake extra virgin olive oil claims really came to light only in 2008, when the Italian government cracked down hard on over 90 farms in the country. Over the past 5 years, research has revealed that nearly 70 percent of imported products labeled as extra virgin olive oil, did not meet the extra virgin standards. This all sounds like a media-concocted conspiracy against the industry, doesn’t it? But with olive oil being so commonplace in our households, this recent attention has even led to the release of a lengthy investigative book, Extra Virginity: The Sublime and Scandalous World of Olive Oil, by Tom Mueller. In it, he reveals that just like old times, many producers today pass off their oils by mixing it with other types, such as canola oil or lower grade olive oil. The in-depth information the book provides is hard to pass off as a hoax. Comparable to the power of oil sheiks today, “olive oil was the source of fabulous wealth and power in ancient Rome,” describes Roman archaeology Professor David Mattingly. Naturally, valuable substances tend to attract fraudsters. In Italy today, mafia syndicates mostly dominate the corrupt trade of olive oil imported from Spain, Italy, and Greece. Quality checks are carelessly skipped by familiar multinational brands such as Bertolli, who don’t produce the oil themselves, but rather buy and sell from others. Some estimates say the profits are comparable to cocaine trafficking and clearly much easier to get away with. You can say it’s a slippery business. The question as you, the consumer wants to know, is how do we avoid the phonies? Countries such as the United Kingdom, Australia, and the United States have established new food fraud centers and more stringent enforcement against these agricultural adulterators. Sadly though, it is otherwise difficult to differentiate the good from the bad without rigorous chemical and taste testing. Even the processors and “experts” can’t always tell by taste alone. There are six grades of olive oil: extra virgin, virgin, refined olive oil, olive oil, olive-pomace oil, crude olive-pomace, and refined olive-pomace. The Extra Virgin label exists as the top grade because it is natural crushed half-ripened olive juice unaltered by chemicals, solvents or heat. This means extra virgin oil is made by a physical process –- and like any fresh product, extra virgin olive oil deteriorates over time. But neither the International Olive Council nor the USDA enforces these standards, so it becomes a matter of honest labeling. 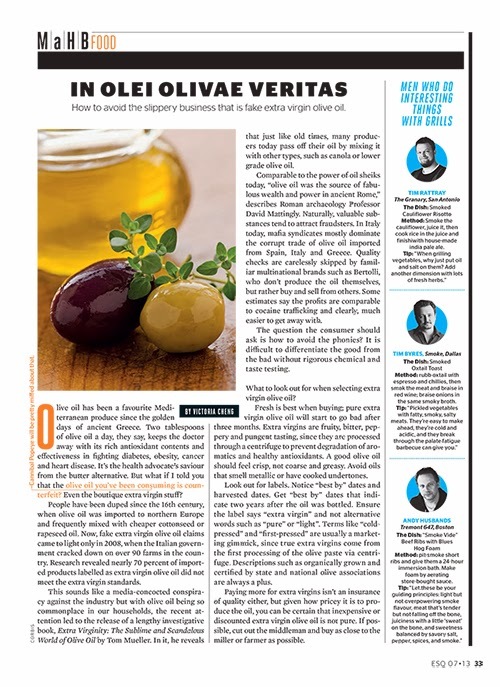 Yes, you can bet your toga that many virgin olive oils are being mislabeled as extra virgin. Fresh is best when buying; pure extra virgin olive oil will start to go bad after three months. Extra virgins are fruity, bitter, peppery, and pungent tasting, since they are processed through a centrifuge to prevent degradation of aromatics and healthy antioxidants. A good olive oil should feel crisp, not coarse and greasy. Avoid oils that smell of metallic or cooked undertones. Look out for labels. Notice “best by” dates and harvested dates. You want to find “best by” dates that indicate two years after the oil was bottled. Ensure the label says “extra virgin” and not alternative words such as “pure” or “light”. Terms like “cold-pressed” and “first-pressed” are usually a marketing gimmick, since true extra virgins come from the first processing of the olive paste via centrifuge. Descriptions such as organically grown and certified by state and national olive associations are always a plus. Paying more for extra virgins isn’t an insurance of quality either, but given how pricey it is to produce the oil, you can be certain that inexpensive or discounted extra virgin olive oil is not pure. If possible, cut out the middleman and buy as close to the miller or farmer as possible. Buy from a local farmer you know and trust (olive oil producing countries also include the United States and Australia). The darker and smaller the container of your olive oil, the better. You’ll want to use the oil quickly and store it away from oxygen in a dark cool place or else it will quickly go rancid. Extra virgin oil is the top grade, but because of its robust and full flavors, sometimes lower quality refined oil will be more economical for things like deep-frying. Alternatively, look for late harvest extra virgin oil, when the flavors are milder for frying or cooking delicate flavors such as white fish and chicken. Early harvest extra virgins are more full-bodied in flavor, making a great accompaniment to bruschetta, red meats, ice-cream (before you balk, try the olive oil ice cream at Osteria Mozza), or vegetables like arugula. Also, the refrigerator test is a myth. The claim is that unadulterated extra virgins will become thick and cloudy as it cools completely. This test is not an assurance of quality and you’ll likely just cut the shelf life of your precious in half by storing it as such.